Tribes Overall: "It was a fantastic trip and a real eye opener. I would never have considered Costa Rica (most people in Europe probably wouldn't) only because it was never on my radar. It's a magical place and has opened my eyes to the whole of South and Central America.The Galapagos was definitely better than I expected. You always fear that somewhere doesn't live up to the hype and won't be quite as good as the "brochure". The Galapagos definitely does and more." Tribes Service: "Paul Cook did a great job of interpreting what was to be fair a vague brief and stiching together a great trip." Guides: "They were all excellent although I would pick out Esteban Romero in Quito and Gabriel on the Passion as being exceptional." Social & Environmental Responsibility: "One of the aspects of the trip was how eager the guides and others we met were about the environment and preserving the natural habitat. You would expect it maybe on The Galapagos but it also very much applied to Costa Rica. " Very characterful and comfortable hotel in the old part of Quito so very convenient for all of the sights and attractions of Quito of which there are many. 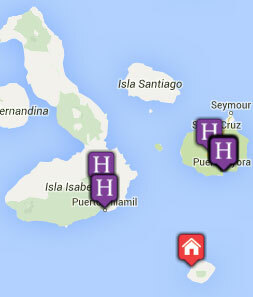 We spent a total of 5 nights there before and after the Galapagos and were very glad we did. Probably the weakest of the places we stayed. A stunning setting but quite remote. it was a drive to everything other than a small local bar which was a walk through what was almost an industrial estate. Accommodation was good but fairly basic in some ways - no heating for example which would have been beneficial in January. The clue is probably in the word "lodge". Nevertheless worthwhile staying for a couple of nights to do the coffee tour etc which was excellent. "The Galapagos. It has always been top of my wife's bucket list and hence the trip in a big birthday year for her. It didn't disappoint and she was genuinly bowled over by it as was I. "